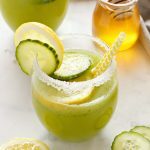 This Healthy Cucumber Lemonade is the perfect naturally-sweetened summer drink made from blended cucumbers, fresh lemon juice and honey! Add the cucumber chunks, water, honey and lemon juice to your blender and blend on high speed until very smooth. Pour the cucumber mixture into a large pitcher through a strainer to catch any pulp that remains. Add the sparkling water to the pitcher, along with some lemon and cucumber slices (and ice, if desired) and stir gently to combine. Pour into sugar-rimmed glasses (if desired) with a few slices of lemon and cucumber, and enjoy with cute paper straws!